The mature tree can reach a considerable height, sometimes as much as 140 feet. The bulk timber may be used for building construction and furniture as well as many utilitarian applications such as handles for spades, brooms, axes and workshop tools like chisels and hammers, even snooker cues. The wood has a distinctive open grain which provides excellent shock absorption for these purposes. Timber from the root section of mature trees is used to make hurleys (or camáns) which are used in one of the best field games in the world, i.e. hurling. Young stems, which is what we use for our sticks, have a smooth grey-green colour. They are distinguished from other species -(though sometimes confused with alder)- by the distribution of buds and side shoots. In ash, these always grow in symmetrical pairs – one on each side of the stem. The stem is flattened somewhat at each node. Another unique characteristic is that the early buds in Spring are capped with a black outer sheath. The greenish/grey bark is not particularly attractive but careful de-barking reveals some pleasing and interesting colours underneath. The combination of these colours and the rings left after flattening bud knots make for an interesting and attractive natural stick. A greatly prized -(though difficult to source in the wild)- walking stick is one which is made using the root as a handle. Here in Ireland such a stick is known as an ‘ash plant’. 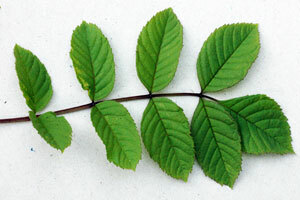 The ash leaf is a compound, pinnate leaf. The central stem of the compound leaf bears 9 – 13 leaflets in pairs, with one at the tip. There are no stalks to the side leaflets. The leaflets are pointed and toothed, with hairs on the lower surface. The leaves appear relatively late in Spring, and are amongst the first to be shed in Autumn. Snakes were said to be repelled by ash leaves or a circle drawn by an ash branch. Irish folklore claims that shadows from an ash tree would damage crops. 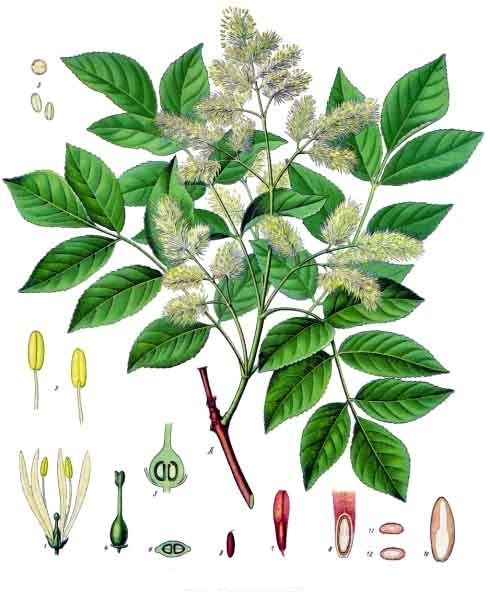 In Cheshire England, it was said that ash could be used to cure warts and rickets. In Sussex, the ash tree and the elm tree were known as “widowmakers” because large boughs would often drop without warning.